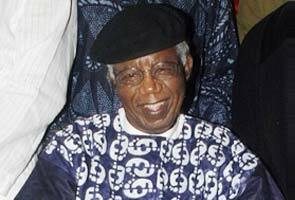 Lagos: Nigerian novelist Chinua Achebe, the revered author of “Things Fall Apart” who has been called the father of modern African literature, has died aged 82, his publisher said on Friday. “I’m afraid it has been sadly confirmed now,” Mari Yamazaki, spokeswoman for Penguin in London, told AFP in an email. Local media reported that he died in a hospital in Boston, Massachusetts. Further details were not yet available, though Yamazaki indicated the family intended to issue a statement later. Achebe was best known internationally for his 1958 novel “Things Fall Apart,” which told of the collision between British colonial rule and traditional Igbo culture in his native southeastern Nigeria. But he had also been a strident critic of corruption and misrule in Nigeria, where endemic graft has robbed Africa’s biggest oil producer of massive sums of public money. He also strongly backed his native Biafra in Nigeria’s 1967-1970 civil war which killed around one million people — the subject of a long-awaited memoir he published last year. In 2011, Achebe rejected a Nigerian government offer to honour him with one of the nation’s highest awards – at least the second time he had done so. He had lived and worked as a professor in the United States in recent years, most recently at Brown University in Rhode Island. A 1990 car accident left him in a wheelchair and limited his travel. “‘Things Fall Apart’ turned the west’s perception of Africa on its head – a perception that until then had been based solely on the views of white colonialists, views that were at best anthropological, at worst, to adopt Achebe’s famous savaging of Joseph Conrad’s ‘Heart of Darkness’, ‘thorough goingly racist’,” the London Guardian wrote in 2007. South African writer and Nobel laureate Nadine Gordimer called Achebe the “father of modern African literature” in 2007, when she was among the judges to award him the Man Booker International prize for fiction. “Just as we read Shakespeare, it is not possible for any English student to graduate without” reading Achebe, Adeyemi Daramola, head of the University of Lagos English department, told AFP recently. While he was widely lauded worldwide, Achebe never won the Nobel prize for literature, unlike his fellow Nigerian Wole Soyinka, who became the first African Nobel literature laureate in 1986. Achebe was born in 1930 the fifth of six children in Ogidi in southeastern Nigeria, where his Igbo ethnic group dominates, and grew up at a time of Christian missionaries and British colonialism. He described his parents as early converts to Christianity, with his father becoming an Anglican religious teacher and travelling the region with his mother to preach and teach. In an interview with The Paris Review, he spoke of how his reading evolved and he slowly became aware of how books had cast Africans as savages. “There is that great proverb – that until the lions have their own historians, the history of the hunt will always glorify the hunter,” he said. He would later attend the University of Ibadan in southwestern Nigeria, the country’s oldest and which he described as having rigorous standards at the time. Achebe worked with the Nigerian Broadcasting Corporation before publishing “Things Fall Apart” – his first novel – in 1958. The seminal novel focuses on a character named Okonkwo and his travails as traditional Igbo culture collides with white colonialists. It initially met with positive reviews, and its legacy has only grown since then. According to his publisher, more than 10 million copies have been sold in 50 different languages. Nigeria, Africa’s most populous nation with some 160 million people, won independence in 1960, but the country’s ethnic divisions and corruption led to coups and conflict. In 1967, Achebe’s native east declared independence for the Biafra nation largely in response to massacres of Igbos in the country’s north, sparking a brutal civil war. Control of the country’s vast oil resources also played an important role in the war. Many of those killed died from starvation and disease, with a blockade having led to food shortages. Achebe grew frustrated with the massive corruption that has plagued Nigeria, where most of the country still lives on less than $2 per day despite its oil wealth. He wrote about such issues, and the first sentence of his widely read 1983 essay “The Trouble With Nigeria” is still often cited here. “The trouble with Nigeria is simply and squarely a failure of leadership,” it reads. Achebe had limited such commentary in recent years amid health troubles. However, during January 2012 protests in Nigeria over a fuel price hike, Achebe issued “A Statement of Solidarity with the Nigerian People” that gained attention back home. His legacy has long been secure in Nigeria but his absence was felt, said Daramola. “For Achebe to have been away for so long, we have indeed missed him,” he said. This entry was posted in Uncategorized and tagged ' dies at 82 - India, 'father of modern African literature, Cardiac, Cardiothoracic, Chinua Achebe, Dr, Dr Sanjay Kumar Cardiac Cardiothoracic Heart Surgeon India, google, Heart, India, Kumar, Sanjay, Surgeon, yahoo. Bookmark the permalink.